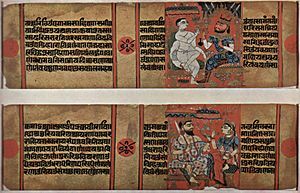 The Vikram era, or Vikram samvat is an Indian calendar starting in 57 BC. The Vikram Samvat calendar starts half a century before the Gregorian calendar and works on an Indian calendar cycle. The current AD BC Gregorian calendar takes lot of inspiration from the Vikram Samvat calendar. The current Vikram Samvat year is 2073! The date marks the day when the King Vikramāditya beat the Sakas, who had invaded Ujjain. A new calendar was started to honor this achievement. The story of this event is told by a monk called Mahesara Suri. The powerful king of Ujjain, called Gardabhilla, kidnapped a nun, who was the sister of the monk. The monk went to the Saka King to get help, and in the end, the Saka King beat Gardabhilla and captured him and made him a prisoner. But in the end, Gardabhilla was forgiven and run away to a forest, where he was killed by a tiger. Vikram Samvat Facts for Kids. Kiddle Encyclopedia.